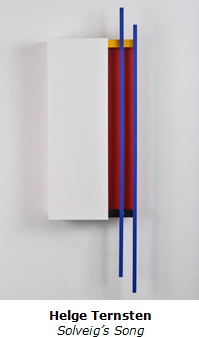 Sanchez Art Center is pleased to present the arresting minimalist works of Helge Ternsten in a show titled It Is What It Isn’t. The opening reception is on Friday, March 3, from 7 to 9 pm. Music for the reception will be provided by Blue City Jazz with Julie and Brian Novak-McSweeney. Helge Ternsten is a self-taught artist who has collected other artists’ works for many years. He quotes his close friend, mentor, and supporter, the late Paula Z Kirkeby, who often said, "You scratch a collector, you'll find an artist." Ternsten showed work at Kirkeby’s Palo Alto gallery, Smith Andersen Editions, and has also exhibited at George Krevsky Gallery in San Francisco, and at both Sanchez Art Center and Oceana Gallery in Pacifica. Ternsten’s work is fascinating. The show is titled after one of his works, It Is What It Isn’t. At first glance a piece may look fairly simple, but when you look closer, you realize there are edges under the edges, changing what might have been a two-dimensional painting into more of a sculptural piece that still looks like a painting. The artist describes his recent work as "minimalist, three-dimensional, and mostly white," but with "something happening on the edges or inside." Ternsten quotes John Cage, the great minimalist composer, who once described some famous all-white paintings as "airports for lights, shadows and particles," thereby establishing an enduring understanding of the works as receptive surfaces that respond to the environmental conditions of their display. Ternsten’s works are indeed ever-changing in response to light and shadow, and what looks simple in actuality has great depth as you look at it from different vantage points. on closing Sunday, April 2, at 3:30 pm.